"Ron was someone who didn't accept societal norms as being his norm." On the morning of January 28, 1986, the space shuttle Challenger exploded shortly after lifting off. All seven crew members were killed. 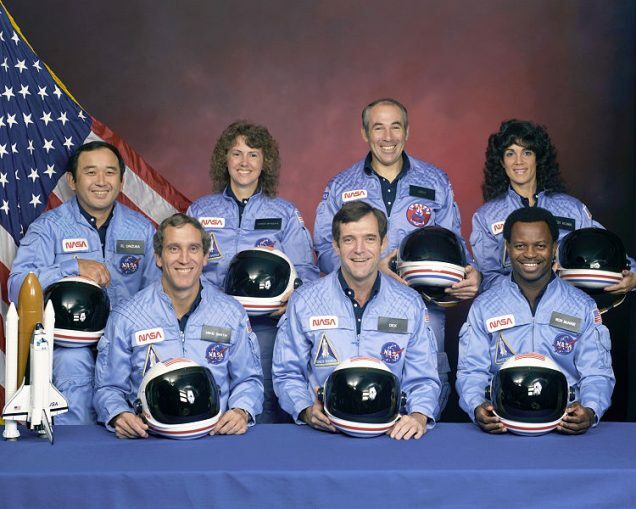 Ronald McNair was one of the astronauts aboard Challenger that day (Challenger crew is pictured at left; Carl is in the front row, far right). A graduate of MIT who grew up in the small farming community of Lake City, South Carolina, McNair was only the second African American to visit space. His older brother, Carl (pictured above), talked about how Ronald’s journey from the rural South to outer space began with an act of courage at the local public library. Click here to watch “Eyes on the Stars,” a StoryCorps animation of Carl’s remembrance. Originally aired January 28, 2011, on NPR’s Morning Edition. CM: When he was nine years old, Ron, without my parents or myself knowing his whereabouts, decided to take a mile walk from our home down to the library, which was, of course, a public library, but not so public for black folks, when you’re talking about 1959. Later on, as youngsters, a show came on TV called Star Trek. Now Star Trek showed the future where there were black folk and white folk working together. CM: And, I just looked at it as science fiction cause that wasn’t going to happen, really. But Ronald saw it as science possibility. You know, he came up during a time when there was Neil Armstrong and all of those guys. So how was a colored boy from South Carolina, wearing glasses, never flew a plane, how was he gonna become an astronaut? But Ron was someone who didn’t accept societal norms as being his norm, you know? That was for other people. And, um, he got to be aboard his own Starship Enterprise.